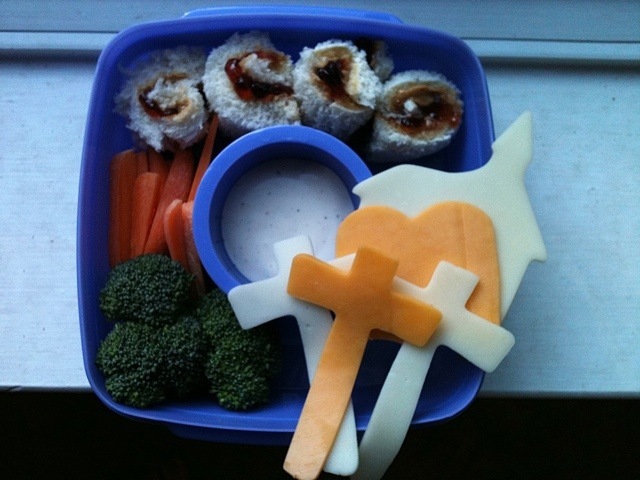 Day two: PB&J roll-ups, carrot sticks, broccoli and cheese shapes. We have provolone crosses and a church and a Colby bible and cross. She goes to a private, religious school, so this totally fits. I want to get the food markers so I can write on her book; we’re teaching her (and her stepsister) to read. And in the process of this lunch (for tomorrow) I realized I forgot to send dip for today’s lunch (it’s 7:30 am), so the broccoli & carrots might come back. We’ll see.